Carrot Raisin Muffins. 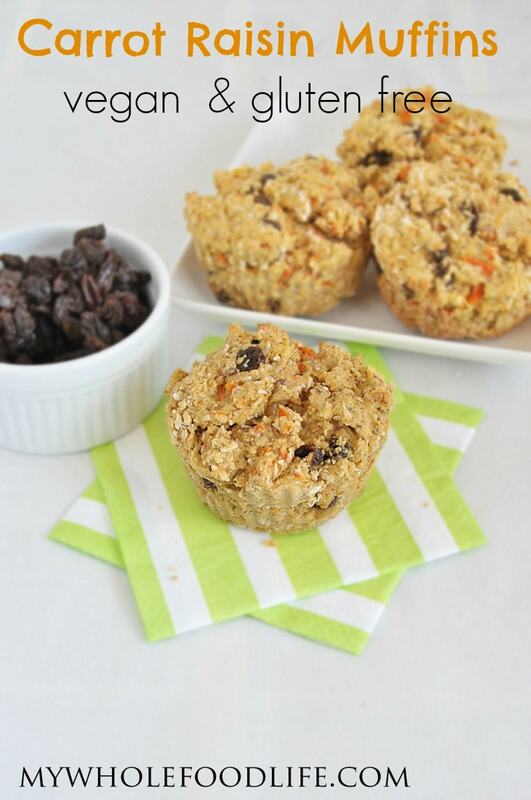 Ever since I made my carrot cake baked oatmeal, I have been wanting to make carrot raisin muffins. My husband is a fan of carrot anything, so I knew these carrot raisin muffins would be a hit. I must be honest though. This was my second attempt at carrot muffins. The first batch of these healthy muffins came out awful. With a few tweaks, I was able to make this batch successful! If you like carrot treats, you may also like my carrot cake larabar bites. Anytime I can sneak some veggies into my kids is a win. They enjoyed these muffins. These muffins are vegan, gluten free dairy free and egg free. Great for anyone that has allergies. My own daughter struggled with dairy and egg allergies for the first 2 years of her life. Normally I use oat flour in all my muffin recipes. I happen to have a bag of gluten free all purpose, so I used that instead. An easy and healthy breakfast! Mix all dry ingredients in one bowl . Spoon batter into lined or greased muffin pans . I used silicone liners for mine. These muffins need to be stored in the fridge. They should last a couple weeks that way. You can also freeze them for up to 6 months! Enjoy! Yum! These look great and I know my kids would love them, too. :) Pinning! Thanks LeAnn and thanks for pinning! These look so good! Thanks, new baking project for the weekend :) Do you have an actual carrot cake recipe? It's one of my favorite desserts-I've tried several paleo style cakes and they were delish, but most of them used almond butter as the base, and I'd like something lighter. Thanks! No carrot cake recipe yet, but it's on my to do list! Going to try this recipe...Once again I need to make a substitute.....Since I can't digest coconut I will try adding more carrots.....I had another thought - do you think I could substitute shredded zucchini instead of the coconut????? Shredded zucchini might be good in here! Thanks and thanks for pinning! I made these today - I used almond flour and I added 1 tsp. vanilla and about 1/3 cup drained crushed pineapple. I had to bake them much longer than the recipe indicated BUT...these are absolutely delicious! I will definitely be making these again. A great recipe. Thank you Jane! Happy you enjoyed them! I love sneaking veggies into our entire family! Muffins are a snack I have around the house often with two teenage boys.Love the addition of coconut. Thanks for the recipe. Can I use regular whole wheat flour in this recipe? Do you use the same amount? Thanks! I would like to try making these in a loaf pan - have you tried this - I have made the muffins several times and we love them ~ just wondering how it would do as a bread. Any thoughts? I think it could work fine. Maybe cook it an extra 10 minutes? Made these and they were really good. I did end up substituting a few things: used 1 cup oat flour and 1 cup almond flour, left out the shredded coconut and had some zucchini to use, so put 1 cup of zucchini and 1/2 cup carrot. Will definitely make again and again! So glad you liked them! Great idea to add zucchini! Do I have to grease silicone cups? I love your blueberry oat flour muffins without eggs.. Is there anything I could sub for the flax egg/egg in this muffin recipe? Thanks! You will need something to help bind. Maybe some banana? what is the calorie count for these muffins. also carb and sugar?? I'm sorry, I don't know. I bet you could plug the recipe into My Fitness Pal for an estimate. Do these actually bake in 10-12 minutes? That seems like a short baking time. I look forward to trying.